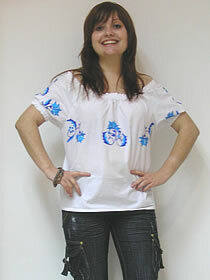 Woman blouse with a machine embroidery. Executed by technics: Poltava smooth surface, cutting, etc. Bright, picturesque for national collectives and a scenic image. 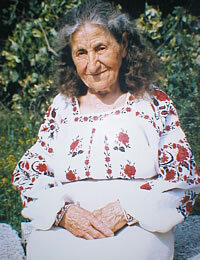 The stylized image of flowers: cornflowers, mallow, poppies; a traditional Ukrainian guelder-rose - a symbol of the maiden beauty. 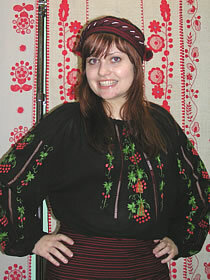 Woman blouse with manual embroidery is executed by the account of each string on a cloth. The diverse of technics: pricking out, cutting out, hem-stitche, a slanting smooth surface, dagger and other. Ornaments from geometrical up to vegetative and their combinations. Are carried out from natural fabrics: marquisette, lawn, a linen cloth, natural silk. In assortment list over 50 figures. The light blouses decorated with manual embroidery, for those who appreciate individuality.